Before we discuss play, let’s revisit CHILDPROOFING : Now more than ever, it is important to make sure your baby has a safe exploration environment. Get on your hands and knees AGAIN and see things through his eyes. Most things picked up will continue to go into the mouth; however, he is beginning to have a more refined grasp so don’t be surprised if baby pinches a small string, a stray snack crumb from an older sibling, etc. and “eats” it. Remember the rule: if it can fit through a toilet paper roll, then it is too small for a child under 3! Now on to the fun! Be your child’s learning partner and coach. 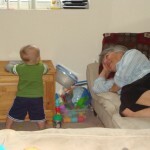 Observe her closely to see what she can do and then help her take the activity a bit further. We often call this the “just right challenge”. For example, encourage her to put one more block on her tower or to try and fit the cube into a different hole. 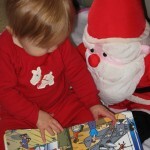 We want to challenge but not have the activity be too difficult that the child loses interest. Follow your child’s lead. The more she directs the play, the more invested she is and the more she will learn. 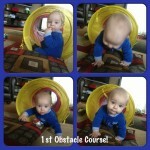 Obstacle Course: since baby will be crawling at super speeds, why not make up an obstacle course as part of play time? Ideas include: couch cushions, tunnels (either purchased or from a cardboard box), or having him crawl over YOU! Crawling over unstable surfaces works on balance, motor planning, and self-confidence. Using tunnels helps baby learn about his body in relation to other objects which helps with both body and spatial awareness. 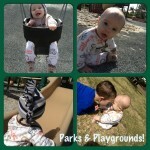 Outdoors: continue to take baby to the park or outdoors to play, explore, and learn. It’s a great opportunity for new sensory experiences: sand, grass, baby swing, or even going down a slide with mommy or daddy. I love to place a blanket on the grass and let my little guy listen to the sounds, crawl around on the uneven ground, sit and watch bubbles. Don’t forget the sunscreen! Push Toys: this is the age that many parents want their baby to use a push toy. We would caution you not to introduce push toys too early since most are lightweight and require baby to move faster than their motor and balance systems are ready for. Instead, try flipping over a laundry basket and having baby push that along the floor – this provides a stable push surface and also more resistance. “Roll, Push, Drop”/Turn Taking: Get down on the floor and play! Try rolling a ball or pushing cars back and forth, using SIMPLE descriptors about the ball and activity. What about dropping a ball into bowl/bucket (in/out) or knocking down a block tower? 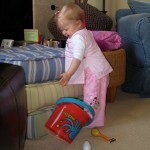 These activities also work on releasing an object well as eye-hand coordination. 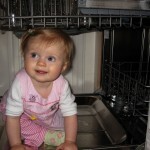 Repetition: whatever the activity, baby will likely want to repeat it! So, go ahead and read the same page of a book, make the same silly sound, etc. again, and again and again. Babies at this age do things over and over again because that’s the way they figure out how things work and doing things repeatedly builds their self-confidence. Repetition builds self-confidence and strengthens the connections in their brains which equals learning! Peer Play: And while you are participating in all these fun activities, have peers and siblings join in. 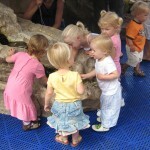 It is never too early to join a play group. The richness of interaction, exploration and understanding of their world expands when many “little” people are engaged together. Even before babies are truly playing with one another, they do notice one another and start to build a foundation of sharing, turn-taking, and all the social skills they will need as they grow up. A play group also gives moms and caregivers time to relax and support one another. Mom’s nights out often stem from playgroups! 🙂 And, they make for some great stories and photo ops (for babies and moms alike).